The catabolite activator protein (CAP), which plays a significant role in telling bacterial metabolism to digest sugars other than glucose, is a classic example of allosteric activation. Binding of the small signaling molecule cyclic AMP (cAMP) switches CAP into an active state that recruits RNA polymerase to certain metabolic genes. The biochemistry of cAMP activation is well understood, but the structural basis is not as clear, because a structure of the inactive protein was not available. This week in PNAS, researchers from Rutgers University and the University of Wisconsin-Madison report a structure of the free state of CAP that illuminates this allosteric effect. Many excellent structural studies have examined CAP in its activated and DNA-bound form. CAP is a dimer, and each monomer has two domains: a DNA-binding domain (DBD) that recognizes its specific sequence, and a cAMP-binding domain (CBD). The monomers bind to each other through a coiled-coil interaction between two long helices. When CAP is activated it binds to DNA, with two helices (the recognition helices) sliding into the major groove and specifically identifying the sequences to which it should recruit the transcription apparatus. Without cAMP bound, CAP can still interact with DNA, but this interaction is of low affinity and not specific for any particular sequence. There are a number of ways this could conceivably happen, but it’s difficult to be certain about any model in the absence of a structure of the free (apo-) protein. In order to determine the structure, Popovych et al. used NMR. The 50 kDa size of the dimer means that it requires some extra effort for NMR work, but it is still well within the capabilities of the technique. The fact that the protein is a symmetric homodimer makes assigning the spectra somewhat easier, as the researcher only needs to deal with 209 residues rather than 418. The authors determined the structure using short-range distance restraints from nOe experiments, long-range restraints from paramagnetic relaxation enhancement, and angular restraints from residual dipolar couplings (RDCs). These angular restraints allowed the authors to unambiguously determine the relative orientation of the DBD and CBD in each monomer. Getting that orientation right is key to the story here, as you can see from the image to the left. Here I’m showing you the DBD and coiled-coil helix (lower left) of a single monomer in the two different states. The activated CAP is in green (PDB code: 1G6N, and the apo- structure is in red (PDB code: 2WC2). You’re looking down the coiled-coil, and the recognition helix is in a brighter color right at the front. If you superpose these structures on the bottom end of the coiled-coil, you can see that the recognition helix is rotated by 60° when cAMP binds. This twist of the DNA binding domain gives the recognition helices the right orientation and spacing to slide into the major groove of DNA and identify genes to activate. In the apo- state, these helices cannot both fit into the major groove simultaneously, explaining the low affinity and lack of specificity in that state. Although the DBDs undergo a radical change in position following cAMP binding, they don’t actually have any direct interactions with the signaling molecule, which binds down in the CBD near the coiled-coil helix. This helix, which links the CBD to the DBD, turns out to be key to communicating the allosteric signal. In the apo- state, the top part of this helix (near the DBD) is actually somewhat disordered and loop-like, not helical. Binding of cAMP to the CBD forms several contacts and causes several structural shifts that result in the formation of regular helical structure at the top of the coiled-coil. This in turn swings the DBDs around so that the recognition helices are in position to interact with target sequences (the authors provide a short movie of this in the Supplementary Information). A similar molecule, cGMP, that does not activate CAP, fails to make the key contacts with T127 and S128 that mediate this structural change. The fact that the upper part of the coiled-coil is unstructured suggests that CAP may sample a range of conformations in the apo- state. This possibility is supported by one of the mutational studies in the paper. As you can see from Figure 5, a G141S mutation and binding of various effectors to the mutant causes the NMR resonances of DBD residues to shift on a line between the WT apo- and WT cAMP-bound states. This, in conjunction with the broadening of those intermediate peaks, suggests that the DBDs are exchanging between the two states on a timescale of microseconds. It seems quite likely that one or both DBDs in the inactive dimer occasionally samples the active conformation. In this model, the function of cAMP would be to stabilize, rather than enable the active conformation. The negative cooperativity of cAMP binding may help keep CAP switched “off” in the face of this conformational heterogeneity. This study only dealt with a single protein, but the results are likely to be applicable to a number of systems. The allosteric mechanism described here seems to fit observations in at least some other members of the protein family to which CAP belongs. As such, this structural work and the dynamics investigations that will probably ensue are likely to provide important insights into a number of regulatory pathways in bacteria. In a post last week I mentioned a technique for obtaining the high-resolution structure of a protein inside a living cell, but I also pointed out that this technique was difficult and expensive, and might not be applicable to large proteins. Techniques improve and become more powerful, of course, but you might not want to wait for NMR to catch up to your question. Fortunately, high-resolution in vivo structures may not be necessary if you already have relevant dilute-solution structures of your protein and merely want to distinguish between different known conformational states. In a recent paper in PNAS, researchers from San Francisco used conformation-specific antibodies to locate activated caspase-1 in cultured cells. Caspase-1 is a cysteine protease that plays a role in the immune response, as well as being released during apoptosis. From crystal structures we know that this protein can adopt two different structures, of which only one represents a catalytically competent state of the enzyme (the on-form). Caspase-1 also possesses an allosteric site where an inhibitor can bind, locking the enzyme in an inactive conformation (the off-form). When it’s not bound to anything (the apo-form) caspase-1 is presumed to have a conformation similar to the off-form. Like many proteases, caspase-1 has a large, inactivating tail when it is made (the pro-form) that must be cleaved off before activation is possible. 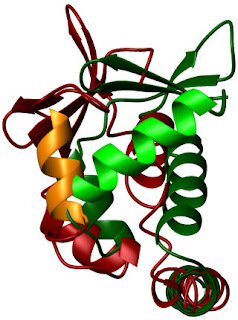 The structure of the caspase-1 proenzyme is not known. Current models of inflammatory response propose that after processing, the on-form binds to scaffolding proteins in an “inflammasome”. In order to confirm this proposition, the authors decided to generate antibodies that would bind specifically to the on-form or the off-form of caspase-1. The key to this experiment was combining irreversible inhibitors that could essentially lock the caspase into one conformation with the phage-display technique for optimizing antibody recognition. The authors had the advantage that both the active site and the allosteric site have cysteines in them. In an oxidizing environment, small molecules can covalently bind to the protein via disulfide bonds, thus locking the enzyme into the on-form or off-form. The authors immobilized these “locked” forms of caspase-1 and used them to screen antibody fragments (Fabs) using phage display. In addition to the typical selection approach, the authors performed anti-selection at one point using the “wrong” conformation to increase the specificity. After several rounds of selection, and some controls to ensure that the antibodies were binding to caspase and not the inhibitors, Gao et al. had several candidates for further optimization and screening. After they completed that process, they had two antibodies, Fabon and Faboff, specific for the two conformations. Each antibody bound to its intended target with a KD of less than 5 nM. The authors also made full antibodies (IgGon and IgGoff) from these Fabs for expression in mammalian cells. The authors took these new antibodies for a spin with the apo-form of caspase-1. One might naively expect that only Faboff would bind to this protein, but in fact Fabon bound as well, albeit with substantially reduced affinity relative to the on-form. One possible interpretation of this finding is that the apo-form is equivalent to the off-form, but that Fabon can convert it to the on-form via an induced-fit mechanism. If this is the case, then we would expect Faboff to have the same affinity for the apo-form as it has for the off-form. However, the authors find that Faboff has reduced affinity for the apo-form relative to the off-form. This indicates that the apo-form is an ensemble of conformational states, most of which more closely resemble the off-form than the on-form. Consistent with this view, the authors found that they can activate or inhibit apo-form activity by adding Fabon or Faboff, respectively. By contrast, IgGon did not bind detectably to a model of the pro-form, suggesting that this form’s conformational ensemble contains no members that are close in structure to the active form. The weak affinity of IgGoff for the pro-form suggests that there are substantial differences between this conformation and the off-form as well. At this point we know that IgGon will bind tightly to the on-form of caspase-1, weakly to the apo-form, but not to the pro-caspase. This means it will likely be an effective probe of active caspase-1 in cells. The authors performed this experiment in THP-1 cells that they differentiated into macrophages. While IgGoff produced diffuse fluorescence in these cells, IgGon stained small, concentrated bodies in a fraction of the cells. This suggests that active caspase-1 is localized to supramolecular structures in these cells, which the authors argue are identical to a structure previously identified as the “pyroptosome”. 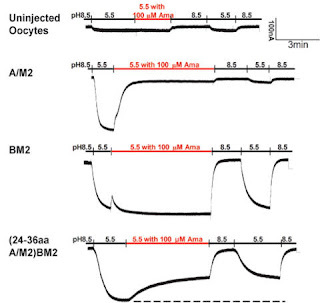 Although this particular experiment took advantage of binding-site cysteines that are particular to caspase-1, it should be possible to extend this approach to other proteins. Even non-covalent inhibitors or activators should be useful in this approach as long as the concentration is held high enough to saturate the target site during the selection step. Of course, the conformational change must alter the structure enough that the antibodies have something to grasp — it may not be possible to get specific antibodies if the shift is too subtle. If this requirement is met, however, it should be possible to determine the distribution of specific conformational states in cells, or even (as the authors suggest) to use antibodies as activators or inhibitors in vivo. Classically, allosteric and cooperative effects have been identified with large complexes of multiple protein subunits, in which the binding of a ligand to one subunit enhances ligand binding in a different subunit. While some features of the models developed to deal with these systems do not translate well to cases of allostery within a single protein or domain, many of their core ideas continue to illuminate these single-subunit systems. In an upcoming paper in the Journal of the American Chemical Society, a team of European researchers examine an allosteric effect based on population shifts in a transcriptional activator, comparing it to a famous model for explaining allostery in hemoglobin (1). The CREB binding protein (CBP) is a large molecular scaffold that brings pieces of the transcriptional machinery together in order to turn on a gene. Like many scaffold proteins it contains several protein-protein interaction domains linked together by large unfolded regions. One of these domains is KIX, a small bundle of helices that binds other proteins at two distinct sites. In one case, a protein called MLL binds to one site while a protein called c-Myb binds at the other. What is so interesting about this is that KIX is much more likely to bind c-Myb when it is already bound to MLL. Brüschweiler et al. used NMR techniques to try and understand how this happens. In order to pull this off they performed relaxation-dispersion experiments on the amide nitrogen, α-carbon, and some methyl carbon atoms of the KIX domain bound to a peptide derived from MLL. Many of the amino acids in the protein showed a significant contribution to R2 from exchange, suggesting a global conformational switch between two states. In order to cover their bases, the authors performed experiments to prove that this behavior was not related to the unfolding of the protein. Satisfied that the protein was stable, they used standard methods to calculate the rate of the conformational change, the population of the two states, and the chemical shift difference between them. They found that the minor state of the KIX-MLL complex is 7% of the total population of protein molecules. They also noticed that the chemical shift difference between the two states correlates very well with the chemical shift difference between the KIX-MLL complex and the KIX-MLL-c-Myb complex. Assuming that the conformation of KIX is the primary determinant of chemical shift in the bound state, this suggests that the dynamics are sensing a switch between a state that doesn’t bind c-Myb and a state that does. 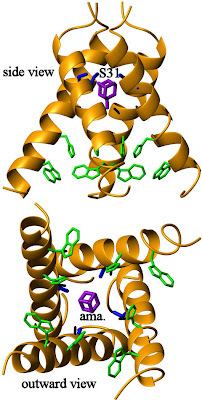 In order to determine whether MLL binding gave rise to this conformational switching behavior, the authors measured relaxation dispersion in KIX at several different concentrations of MLL. Excluding residues highly sensitive (by chemical shift) to MLL binding, they found that the exchange contribution to relaxation increases as MLL is added. Although Brüschweiler et al. were unable to fit this small number of residues quantitatively, these results strongly suggest that the addition of MLL increases the population of the c-Myb binding state. Moreover, under conditions where KIX forms a saturated complex with MLL and a peptide from another protein (pKID), the chemical exchange contribution to relaxation vanishes, suggesting that the protein has been pushed completely to the binding-competent state. In order to identify the pathway by which the MLL binding site communicates to the c-Myb binding site, the authors examined the residues in KIX that had the largest chemical shift change associated with the chemical exchange behavior. As it happens, residues satisfying these criteria cluster in a region stretching from the MLL site to the c-Myb site, as you can see to the right (explore this structure at the PDB). Here, KIX is blue, the MLL peptide is red, and the c-Myb peptide is green. The side chains of the residues Brüschweiler et al. identify are shown as sticks inside the pink atomic surface. As you can see, these residues constitute a contiguous body stretching from one site to the other. Presumably, this set of residues provides a pathway for communication between the two sites. A trio of isoleucines at the core of this region (I 611, 660, and 657) are present in KIX domains from many different species (supporting information), suggesting that this communication pathway is evolutionarily conserved. Mutational studies centered on this trio of residues may teach us more about the mechanism of information flow in this domain. Although this allosteric pathway is known to work in reverse (binding of c-Myb enhances the binding of MLL), the authors were unable to detect any exchange contribution to R2 when only c-Myb or pKID was bound. While this may suggest that communication in the opposite direction uses a completely different mechanism, such that KIX has two unidirectional allosteric pathways, that’s not a necessary conclusion from this result. Alteration of R2 due to conformational exchange is dependent on the populations of the two states, the difference in chemical shift between them, and the rate of the switch. Actually detecting a dispersion curve requires that all these parameters lie within a ‘sweet spot’ that allows observation. This doesn’t always happen, even when a dynamic process is occurring with a μs-ms rate. Because the chemical shift changes that result from MLL binding appear to be quite large (2) the exchange process may be slow on the NMR timescale. One minor concern I have with the paper is that the experiments were carried out at a pH of 5.8, which is lower than the pH of cytosol (7.2). The only groups likely to change their charge over that range are histidines, but one of the key residues for this paper is H651 in the KIX domain. The experiments that established the allosteric effect of MLL on c-Myb binding (2) were performed at pH 7.0 so it is formally possible that the dynamics and allostery are a coincidence (although the chemical shift data argue against this). It would probably be worthwhile to perform HMQC experiments to clarify the protonation state of the histidine, or to repeat the binding experiments at a lower pH. The latter might be preferable; I assume that mildly acidic conditions are used for the NMR experiments because KIX has undesirable spectral characteristics nearer neutral pH. Additionally, it might be interesting to perform experiments that explore the effects MLL has on the kinetics of binding, seeing as this appears to be a dynamic process. Brüschweiler et al. identify their results with the Monod-Wyman-Changeux model of allostery. Although this model was formally developed for systems with multiple subunits, what the authors really wish to emphasize is the idea from the MWC model that proteins in solution exist in an equilibrium of high-affinity and low-affinity forms. The evidence from the relaxation-dispersion experiments indicates that a very small proportion of free KIX exists in a (unfavorable) conformation that’s ready to bind c-Myb. 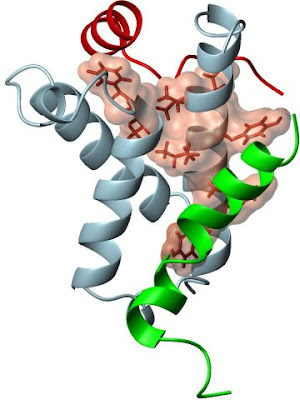 The binding of MLL enhances KIX affinity for c-Myb by stabilizing this structure — the allosteric effect arises because MLL binding defrays the energetic cost of adopting this fold. This manifests as a shift in the population of KIX proteins towards the binding-competent state. This kind of binding cooperativity may play a significant role in CBP’s transcriptional activation function.